Metal Gear Solid 4: Guns of the Patriots is a mere 10 days away from release, but if you're like me, you might need a refresher on your Metal Gear back-story. I was first introduced to the series with Metal Gear Solid on the original Playstation and I've been hooked ever since Snake picked up his binoculars and looked at Shadow Moses for the first time. 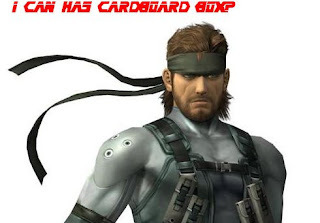 Younger gamers may be surprised to learn that this wasn't Snake's first mission though, the hero was a vet long before he met the likes of Sniper Wolf or Psycho Mantis. Gametrailers.com is running a series of retrospectives on the Metal Gear games. They provide detailed information on the plots, characters and series-ruining metrosexuals who whine to their ladies about how tough the mission is. Be warned, they are spoilerific, and one might argue that the stories are best experienced for the first time by actually playing the games rather than in movie form. If you just need to get caught up before Snake takes to the battlefield for the last time, then set your codecs to this frequency. R U a GTA4 Cheat??? Poll: Which Product Would You Rather Own?